Would I be interested in creating a map of a fictional Port William, the setting for more than 30 years’ worth of Wendell Berry’s fiction? Mr. Berry had sketched a layout of the area and included, for reference, topographic maps of the part of Kentucky that informed his imagining of Port William. My job was to clean it up, make the place look real, and size the map for endpapers for a new volume of collected fiction to be called That Distant Land. I made several pencil sketches until I was happy with the layout then built a topographic model for my own use, to make sure the topography worked as it would in a real landscape. (My years of using USGS maps in the field as an archaeologist came in handy, as they always do.) I sent off a neat version of the map to Counterpoint, who shared it with Mr. Berry. His daughter read the stories against the map to make sure everything worked. Think about it. He had written about the place, developing it in stories for years, but perhaps didn’t know that he’d keep writing about it, that the work would be collected, and that story details might contradict each other. For example, if a character crossed a creek while heading east, which creek would it have been, and where would they be headed? Who might they pass along the way? Contradicting details were worked out in subsequent drafts until everyone was happy. I added a frame with leaves of the tulip poplar—Kentucky’s state tree—in the corners. The map was printed in my favorite place—as endpapers—and continues to appear on the pages and dust jackets of Mr. Berry’s books. 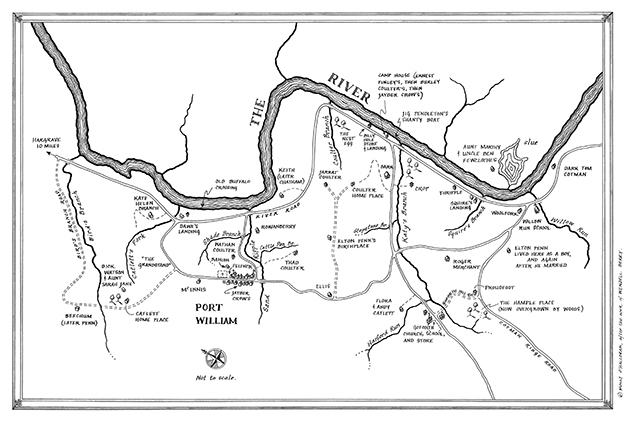 I hope your joy in reading Mr. Berry’s fiction is enhanced by the Port William map. Through an arrangement with Mr. Berry and Counterpoint Press, I am pleased to offer prints of this map for sale. Wishing you lots of time for reading, and many Wendell Berry books on your shelf.